Préfacier : Sansen Willy M.C. Foreword by Willy Sansen Broadband opamps for multi-channel communication systems have strongdemands on linearity performance. When these opamps are integrated indeep sub-micron CMOS technologies, the signal-swing has to occupy alarge part of the rather low supply voltage to maintain thesignal-to-noise-ratio. To obtain opamps with low distortion it isnecessary to do a thorough analysis of the nonlinear behaviour of suchcircuits and this is the main subject of Design Criteria for LowDistortion in Feedback Opamp Circuits. The biasing of each transistor in the circuit is a major issue and isaddressed in this work. It is important to bias the transistor suchthat the distortion is low and stable in the entire range of itsterminal voltages. This will ensure high linearity and robustnessagainst variations in circuit conditions such as power supply voltage,bias current and process variations. Design Criteria for Low Distortion in Feedback Opamp Circuits iswritten for Analog CMOS designers. List of Figures. List of Tables. Symbols and Abbreviations. Foreword. Preface. Acknowledgement. 1: Introduction. 1.1. Motivation. 1.2. Earlier Work. 1.3. Design Issues for Low Nonlinear Distortion. 1.4. Outline. 1.5. Summary. 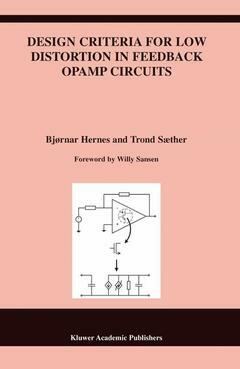 2: Specification and Analysis of Nonlinear Circuits. 2.1. Linearity Specifications. 2.2. Volterra Series. 2.3. Phasor Method. 2.4. Concluding Remarks. 3: Biasing and Opamp Modeling for Low Distortion. 3.1. Biasing for Robust Linearity Performance. 3.2 Opamp Modeling for Nonlinear Analysis. 4: Nonlinear Analyzes of Feedback Miller Opamp. 4.1. The Non-Inverting. 4.2. The Inverting Configuration. 4.3. Concluding Remarks. 5: Opamp Circuits with High Linearity Performance. 5.1. Measurement System. 5.2. A 1.8V CMOS Opamp with -77.5dB HD2 and HD3 at 80MHz. 5.3. A 3.3V CMOS Opamp with -80dB HD3 at 80 MHz. 5.4. A 3.3V CMOS Current Opamp with -63dB HD3 at 100MHz. 5.5. A 3.3V CMOS Unity-Gain Opamp with -80dB HD3 at 10MHz. 5.6. Concluding Remarks. 6: Conclusions and Discussions. 6.1. Opamp Topologies Versus Linearity. Appendix A:Transistor Model. Appendix B: Closed Loop Opamp Transfer Functions. Appendix C: Open Loop Opamp Transfer Functions.